As in commissioning, decommissioning needs to be grounded in a sound and wide-ranging understanding of current and future user needs and levels of demand, service costs, market situation, priorities, key stakeholders, and the drivers for changes to services. The extent to which this currently happens varies especially in the context of rapid service decisions being needed. The practical example linked below draws these points out from a real life example of how to effectively assess need and make a decision to change services. 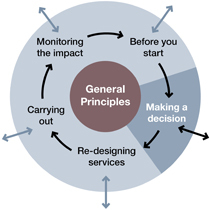 Making a decision to decommission: What does good practice look like?